For the video game, see Zoombies: Animales de la Muerte. Zoombies is a 2016 American made-for-television science fiction action horror film directed by Glenn R. Miller and written by Scotty Mullen. The story follows a small staff and some visitors of a to-be-opened zoo affected by a mysterious virus which turns the animals into meat-seeking aggressive zombies. The Eden Wildlife Zoo, a zoo containing endangered animals, is having its intern orientation day, where college students applying for jobs as interns are touring the zoo. Meanwhile, some the zoo's monkeys contract an unknown disease and are taken to the clinic where the veterinarians use intracardiac epinephrine, a forbidden serum, in order to save the life of a monkey that suffered a cardiac arrest. The contagious pathogen spreads to all of the monkeys in the room, turning them into zombies with a predatory behavior towards humans. They attack the veterinarians and kill two of them, while the remaining one manages to activate an alarm. As the college students arrive, the alarm reaches the zoo's security. One of the security team members, Johnny, decides to check on the veterinarians himself. However, when he doesn't return, the security team, accompanied by college student Gage, make their way to the clinic. Once there, they discover that Johnny and two of the veterinarians are dead. The remaining veterinarian, Dr. Gordon, is barely alive. The monkeys violently confront the group, killing two of the guards. Gage, head of security Rex and newly hired Lizzy Hogan manage to escape. Ellen Rogers, the manager of the zoo, gets word of the mayhem and puts the zoo on lockdown. The disease spreads throughout the zoo, infecting a group of wild hogs that attack three of the students. Lizzy, Gage and Rex arrive just as the students are attacked by infected giraffes, which kill two of the students. They manage to rescue the remaining student, Amber, but Gage is injured in the process. As Lizzy and Rex tend to Gage's wounds, Amber steals Rex's jeep. Lizzy, Gage and Rex are forced to use a group of non-infected elephants as transportation. A police team arrives to eliminate the threat but they are killed by a group of infected lions. Amber, meanwhile, reaches the front gate and demands that Ellen, who is watching over the security cameras, open it. A gray wolf suddenly attacks her. Ellen's daughter Thea is then attacked by an infected koala but she kills it with a baseball bat. Ellen inspects the koala's blood and finds out that the disease was created by an unknown enzyme found in the koala's cerebral cortex. She encourages birdkeeper Chelsea to release the birds to prevent them from being infected, to no avail. Meanwhile, Lizzy, Gage and Rex are attacked by a group of infected lemurs and Rex is injured. One of the workers, Daxton and his intern A.J. manage to fend off the zombies and the group takes refuge inside of the gorilla lab. Daxton goes to check on the zoo's endangered Cross River gorilla, Kifo, finding him to be infected. Kifo kills him and invades the lab. Rex stabs him, but Kifo decapitates Rex in retaliation. Lizzy, Gage and A.J. escape and find a jeep with a feeble and dying Amber driving. Amber dies and the group is attacked by a group of infected lions as they remove her corpse. They manage to kill the lions but they accidentally crash the jeep in the process. They then attempt to reach the watch tower by using an unfinished zipline. A.J. falls to his death in the process. The group reunites with Ellen and Thea and they theorize that the birds have become infected. They decide to set the aviary on fire using a series of gas cans, but before they do so, Lizzy and Gage go inside to rescue Chelsea and her intern Ricky. However, they soon find that they have both been killed by the infected birds and escape. Ellen reluctantly sets the aviary on fire and they set off an additional explosion using Ellen's truck, killing the birds. Kifo then appears and chases the group to the gate where Ellen seemingly shoots him to death. The four are then rescued by a helicopter. However, after they are rescued, Kifo regains consciousness, revealing he is still alive. Ted Hentschke of Dread Central rated the film 3/5 stars and wrote, "There's nothing defensibly good about this movie. What it is, however, is fun." ^ Foy, Scott (2016-02-18). "Zoombies Trailer Unleashes Undead Monkeys, Koalas, Parrots, Lemurs, Lions, and Giraffes – Oh My!". Dread Central. Retrieved 2016-12-22. ^ Hentschke, Ted (2016-05-17). 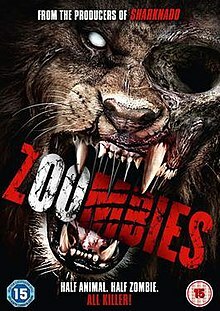 "Zoombies (DVD)". Dread Central. Retrieved 2016-12-22.